The Napa Valley Unified School District opted to build “green” with a certification from the Coalition for High Performance Schools (LEED equivalent in the education design world). 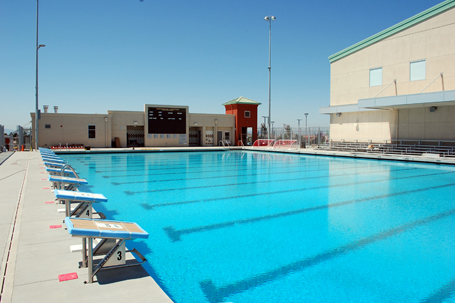 American Canyon High School includes a library; administration; a 400-seat theatre; a 2,500-seat gymnasium; four small learning communities; several specialized academy buildings; and an outdoor swimming pool. American Canyon High School, opened August 2010, is a pioneer in the growing movement to fund and build healthy high performance schools. Sustainable design elements include a one-megawatt photovoltaic system, recycled and rapidly renewable materials, ground loop geothermal system to minimize heating and cooling, and abundant daylight to reduce dependence on artificial lighting.